(CNN) — When CEO Jen-Hsun Huang stepped on stage at the Consumer Electronics Show to unveil the new Tegra 4 CPU for smartphones and tablets, he proved Nvidia isn’t messing around in the mobile space. It claims its quad-core system-on-a-chip will out perform any other around, including the A6X chipset powering Apple’s iPad. If you’ve never heard of Nvidia’s Tegra line, chances are you’ve used it. Countless Android, Windows Phone and Windows RT products are built around previous-generation Tegra guts, including Google’s Nexus 7, Microsoft’s Surface tablet, HTC’s One X smartphone and the Sony PSP handheld gaming device. Like the Tegra 3 before it, Tegra 4 features four discrete cores, along with a low-power fifth core that is used for light processing tasks such as email or messaging. (That extra core extends the life of any device’s battery.) But this time around, Nvidia used 1.9 GHz ARM A15 cores — the new cutting edge for speed freaks — as its reference design. That power boost ensures blazing performance with 45% less power consumption. Nvidia’s splashiest CES announcement, though, was its cannonball dive into the gaming gadgets market. 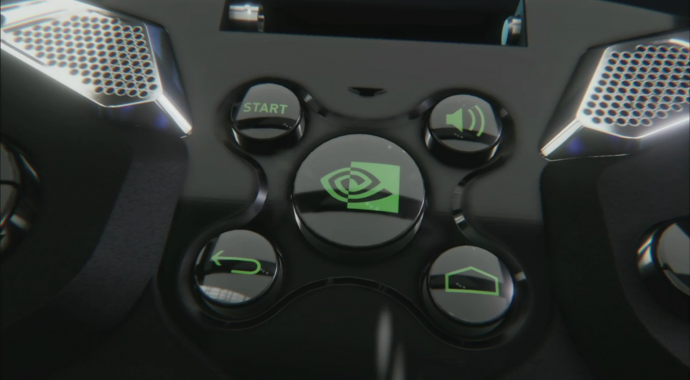 The Shield is Nvidia’s first foray into a full-fledged consumer product. It’s got controller components that the company says rival any console game pad, 14 hours of battery life, and a stock build of Android, which means it can be updated as quickly as Google (GOOG, Fortune 500) allows. In terms of design, the device itself looks like the victim of Nvidia’s quest to provide a compromise-free gaming experience — which is to say, it’s cumbersome and unattractive. Then again, there aren’t many ways to cram a full console controller and a 5-inch display into a portable without sacrificing something. Nvidia’s gaming ambitions don’t end there. It’s also working on Grid, a cloud gaming service it believes will succeed where other services, such as OnLive, failed. Here’s Grid gist: Anyone with an Internet-connected TV, tablet, or Shield will have access to PC-caliber games thanks to cloud processing. Your input from the controller is sent to a server tucked away in some remote data center, which will do all the heavy lifting that a PC or an Xbox or a PlayStation would typically do. It then streams the visuals back to you. The company claims Grid is performance-maximized and lag-minimized to a point where it’s on par with a console. It offered no details on when the Grid service will be available to consumers or how much it will cost, but the idea that someone could get an up-to-date gaming experience without having to shell out hundreds of dollars for the latest consoles is one that will forever entice.